Join the discussion on our forums! 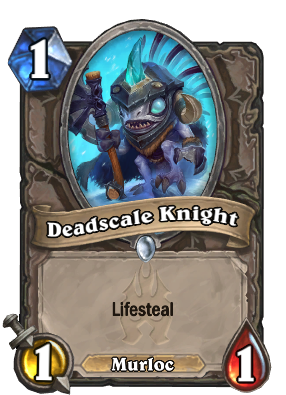 Come discuss Deadscale Knight over in our dedicated Deadscale Knight discussion topic. Not bad. Might see play in murloc paladin. You're about 4 months late mate. Why are you even replying to this? hey kids! did you know that the pentagon did 9/11? But this is a murloc .. can be buffed realy easy and then it becomes more worthy than doctor. what are the odds of you having low enough health for it to have value on say, turn two or three? More Murloc Knight nerfs. Come on, I want to summon more Murloc Knight with Murloc Knight, or at least >2/2 murlocs. Why do you keep introducing garbage murlocs? Except for the murloc tag, this thing is actually much worse than Voodoo Doctor. Jeez. Should have been a 1/2. He's really a death knight, guys. A serious one. Really! Stop saying he's cute. it's cute. I think that's all I can really say about it.